Description: Depicting bare trees against the winter sky-inspired Branches lighting design, this fused glass ceiling fixture features Frosted White art glass drizzled with Midnight Black branch patterns. The stunning shade is adorned with Polished Nickel, Maple Leaves and supported by Solid Brass hardware featured in a Craftsman Brown finish. 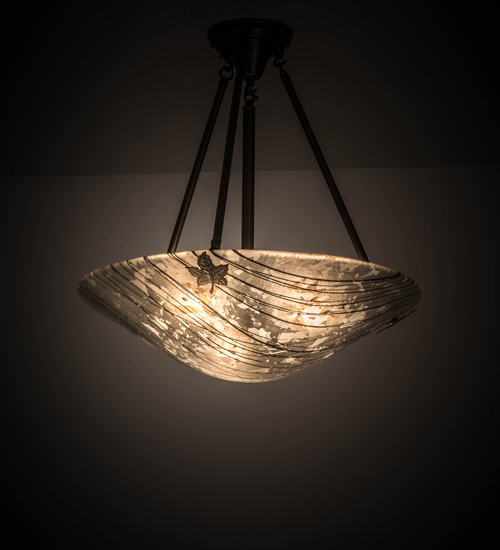 Handmade by Meyda Craftsmen, the fixture is a pleasant retreat from the ordinary. Made in the USA at the foothills of the Adirondack Mountains. Custom options available. UL and cUL listed for damp and dry locations.